The Magellan 9800i from Datalogic is a top-notch product from the market leader in installation scanners. It is the first installation scanner which is fully equipped with imager technology, and thus quickly and reliably reads both 1D and 2D barcodes. This high-speed device ensures for particularly high throughput. The optical and acoustic scan confirmation increase checkout personnels efficiency. With the help of an integrated analysis tool you additionally increase user productivity as you please. Perform maintenance, software updates, etc. directly on site from the top, so that the housing remains in the counter. Installation of a professional precision scale is also possible. Its housing is slim, so that its space-saving design gives you maximum flexibility when setting up the checkout. 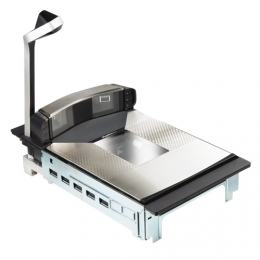 With the help of the optional top-down reader you considerably expand the scanning area. Two different heights are also at your disposal. At the same time the integrated customer-facing imager reads barcodes from customers mobile telephones for E-Commerce applications. This occurs simultaneously with the checkout process and saves valuable time.